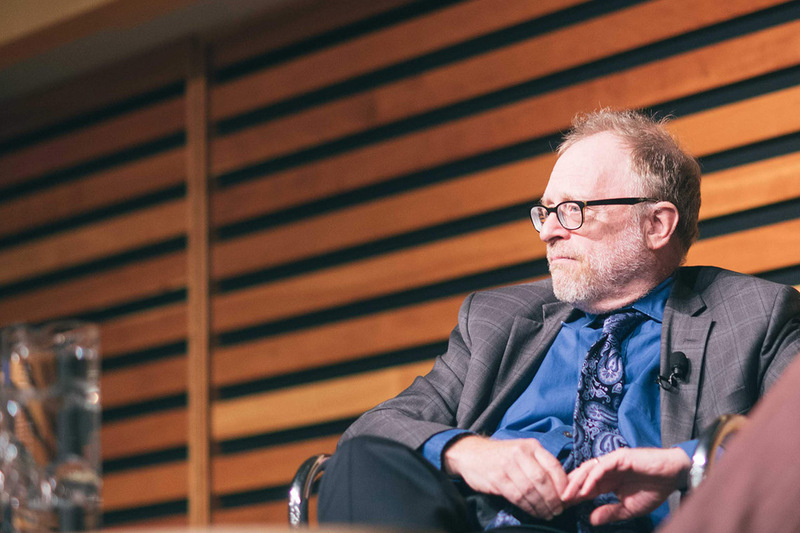 Sam Tanenhaus, a prolific and influential journalist, author, historian and former editor of the New York Times Book Review, is teaching two courses at the University of Toronto this term as a visiting professor for book and media studies at the University of St. Michael’s College. His articles and essays appear in Vanity Fair, Time, Esquire, The New Republic, The New York Times Magazine, The New Yorker, The New York Review of Books and many other publications. His books include Whittaker Chambers: A Biography (1997) and The Death of Conservatism (2009). He is working on a biography of William F. Buckley Jr.
Tanenhaus will moderate a discussion on Friday on The Art of the Book Review, with Jennifer Szalai, a U of T alumna who is a nonfiction book critic at the Times, and Randy Boyagoda, an English professor who is the principal of St. Michael's and long-time contributor to the New York Times Book Review. Tanenhaus speaks to Mary Gooderham about his teaching at U of T, his writing and what makes a good book review. How are reviews received by authors? How do they feel about the negative ones? Miserable. Do not believe any author who tells you that he or she doesn’t read reviews. It’s just not true. When I was editing the Book Review, I would hear from some of the most famous authors alive who might not be happy with a line or two in a review that was otherwise laudatory. Authors have a proprietary view – and I’m no different – of their work. They tend to think reviewers are dismissive, skeptical or they haven’t really read the book. Sometimes I’m afraid it probably is. Reviewers are not paid very well, and it’s a lot of work. When I do a long review for a publication, like the New York Review of Books, I’ll re-read a book a second and third time, to make sure I’ve really got command of it. There’s fewer places in print these days for book reviews, do we really need them? If there’s a good local reviewer who readers trust, in a big city like Toronto or a smaller town somewhere, that can do more for a book than the splashier forms of promotion and publicity. Now, that said, many readers now turn to Amazon reviews, and there's a lot of book discussion today online. I don’t follow more than a fraction of it. I’m kind of an older legacy media guy who’s just watching the world change. Why did you come to teach at the University of Toronto? I’m near to completing the first draft of my book, and teaching for somebody like me gives a little structure to the week. My wife Kathy Bonomi is a film curator, and she was able to get an industry pass for TIFF. So here we are. How are you liking Toronto? We love it. In Connecticut we live out in the country and it’s beautiful, it’s quiet, it’s a great place to work, but to be back in a vibrant, really livable city like Toronto has been very gratifying for us. Have you enjoyed the teaching? It’s fantastic. I’ve done a fair amount of teaching at one place or another in the U.S., but this is great. The students are just the best, I really like them. I do two courses, including a large lecture course, which is really just a big conversation among 180 of us. It’s called Trump in the Media; we sometimes call it “Trump in Real Time." We have readings but we spend a lot of time viewing video, sometimes it’s live. We watched Brett Kavanaugh’s prepared remarks to the Senate Judiciary Committee live, then after that we screened Christine Blasey Ford’s statement. That’s the kind of thing we do; it’s very stimulating. What’s it like teaching this in Canada? It’s very instructive for me. I do not exaggerate – and the kids will confirm this – they do most of the talking. I’m kind of a ringmaster, and I bring in a little history and background. It’s hard to make coherent sense of politics in this moment, so if you step away from it, as I’ve been lucky enough to do, and talk with really smart, young people, it gives a perspective and a balance which I would never get in the U.S. I’m very grateful for that. What’s the other course you're teaching? It’s a seminar on long-form journalism, I call it “The Art of Non-Fiction Narrative.” There are 30 students. We do an old-style close reading, and then the students write their own journalism, and you would not believe some of the stuff I’ve seen. Stories come through that I think belong in major feature magazines. They’ve all got the bug now, they all want to be New Yorker writers. Speaking of long-form writing, tell us about the process of putting together your book on William F. Buckley Jr.? Let’s just say it’s been a really long time. He was alive when I started writing, because he wanted me to do it. I’m closing in on the finish. There are two kinds of writers, putter-inners and taker-outers, and I’m both. My work habits I would say are of zero interest to anyone, but I just pile up a lot of pages and I try to turn those pages into a manuscript. I’m guessing the book will be maybe 600 pages, and that will be about a third of what I will have when I complete this first draft. You wrote The Death of Conservativism and you’ve been doing interesting political features for publications like Vanity Fair and Esquire. Any possibility you’ll write a quick political book? Well, I’m doing a long political book. Buckley is political, he’s the greatest intellectual in the history of modern conservatism. This may do it for me on big books on politics, though I may do a little book on the U.S. Constitution – which I think needs to be either rewritten or abandoned – after I finish this. Your students must have been fascinated with reporting of the U.S. midterms, any lessons there? My class and I looked at some the media coverage: We looked at CNN for instance, and the horse-race coverage – I just wish it would stop. I understand why they do it, but I think we’ve entered a media culture of artificial or invented narratives that actually feed some of the baser impulses in our aggressive politics. So that’s one of the takeaways I have – it was really striking. And by the way, the students get this instantly. They are great parsers of media. What's the alternative to the horse race? In my class we watch 20 minutes of coverage and I’ll say, ‘What did we not see here? We didn’t see a single non-media person or spinmeister or operative for one of the two parties giving a little speech or having a brawl.’ In the U.S., there's endless commentary by the media about the media and very little about what's on the minds of voters and what their lives are like. That is certainly one alternative. I look at the home page of the New York Times and it’s one polemical assertion after another, and I think it’s not doing anyone any good. I’ve stopped doing that kind of writing. I report now. If you look at my last stories, they were reported. I did one in The New Republic that’s a historical kind of political science piece – it draws on documents in archives. I did a story for Time magazine, my first story ever for them, it was on the cover, it was about young policy analysts who actually think Trump gives the Republican party new opportunities to shed the libertarian economic policy of the Reagan and Bush years, and it’s reporting. I just talked to them. I did the story from here, I did it on the telephone. The lesson I’ve learned –you interview people, talk to them, not just say what you think. Nothing’s easier than to give your opinion, but to find out what somebody else thinks, to hear how they speak, what issues come up, I’d like to see more of that. The Art of the Book Review will take place at the Isabel Bader Theatre on Friday, Nov. 30. Students receive $10 off the ticket prices using the code STUDENT.